Hailing from a political family with deep roots in the state of Louisiana, Mary Landrieu began building her political career in Baton Rouge.1 After serving in the Louisiana legislature and state treasury, she became the first woman elected to the U.S. Senate from Louisiana in 1996.2 Landrieu came to Washington as a self-styled centrist Southern Democrat representing a state with a growing Republican electorate. During the Barack Obama administration, several controversial votes eroded her support among many in her home state. Despite these difficult circumstances, Landrieu was able to forge significant victories for Louisiana on energy policy and disaster relief during her tenure in Congress. In the Senate, Landrieu joined with other “New Democrats” to support what she called the “sensible center.”7 This principled approach was a product of her political pragmatism. As a Democrat from a Southern state, Landrieu tried to maintain a delicate balance between constituent concerns in Louisiana and those of her fellow Democrats in the Senate. 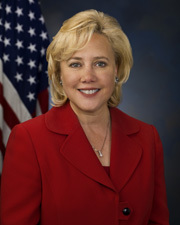 When she entered the 105th Congress (1997–1999) in January 1997, Senator Landrieu received assignments on three committees: Small Business; Energy and Natural Resources; and Agriculture, Nutrition, and Forestry. She resigned the Agriculture, Nutrition, and Forestry seat in the 106th Congress (1999–2001) for a post on Armed Services, becoming the first Democratic woman to serve on this committee, where she remained until 2002. In 2001, she was named to the influential Appropriations Committee. 1Thomas Fields-Meyer, Macon Morehouse, and Gabrielle Cosgriff, “Born to Run: Sen. Mary Landrieu of Louisiana Keeps Politics a Family Affair,” 20 August 2001, People: 93. 2“Louisiana Republican Drops Election Challenge,” 18 November 1996, Washington Post. 3Politics in America, 2004 (Washington, D.C.: Congressional Quarterly Inc., 2003): 430. 4Almanac of American Politics, 1998 (Washington, D.C.: National Journal Inc., 1997): 626–627. 5“Election Statistics, 1920 to Present,” http://history.house.gov/Institution/Election-Statistics/Election-Statistics/. 7Politics in America, 2004: 430. 10William Neikirk, “Big Easy’s Tough Advocate,” 16 September 2005, Chicago Tribune. 11Politics in America, 2008 (Washington, D.C.: Congressional Quarterly Inc., 2007): 428. 12Hearing before the Senate Subcommittee on Homeland Security of the Committee on Appropriations, Hurricane Sandy: Response and Recovery, Progress and Challenges, 112th Cong., 2nd sess. (2012). 13“Hearing Explores Flaws in Aiding Storm Victims,” 3 December 2009, The Times-Picayune (New Orleans). 14Christopher Cooper, “In Katrina’s Wake: Where is the Money?,” 27 January 2007, Wall Street Journal. 15Almanac of American Politics, 2014 (Washington, D.C.: National Journal Inc., 2013): 726. 16Politics in America, 2014 (Washington, D.C.: CQ-Roll Call, Inc., 2013): 421. 17Coral Davenport, “New Offshore View for Coastal States,” 8 September 2008, CQ Weekly. 18Politics in America, 2010: 435. 19John Hill, “Landrieu Bridges Party Gap,” 14 January 2007, The News-Star (Monroe, La.). 20“Landrieu Amendment Opens Door for Reforming Foster Care-Financing System,” 13 April 2009, The Louisiana Weekly: 22. 21Politics in America, 2014: 422. 22Christopher Tidmore, “Obama Health Care Solution Helps Landrieu’s Re-election,” 18 November 2013, The Louisiana Weekly: 3. 23Deborah Barfield Berry, “Republicans Attack Landrieu for Health Care Vote,” 24 November 2009, The Times (Shreveport, La. ); Christopher Tidmore, “An Analysis: Sen. Landrieu’s Snowe Job,” 19 October 2009, The Louisiana Weekly. 24Almanac of American Politics, 2014: 725. 26Bobbie J. Clark, “Five Questions with Senator Mary Landrieu,” 21 August 2010, The Times (Shreveport, La. ); Field Hearing before the Senate Committee on Small Business and Entrepreneurship, The Deepwater Drilling Moratorium: An Economic Disaster for Louisiana’s Small Businesses, 111th Cong., 2nd sess. (2010). 27“Landrieu Blocks Obama Nominee in Protest of Drilling Moratorium,” 24 September 2010, Wall Street Journal; Aaron Blake, “Landrieu, Vitter Threaten to Block Potential Fugate Nomination,” 29 July 2013, Washington Post. 28The RESTORE Act was passed as part of the “Moving Ahead for Progress in the 21st Century Act,” Pub. L. 112-141. Deborah Barfield Berry, “RESTORE Act Closer to Becoming Law,” 22 April 2012, Pensacola News Journal; Campbell Robertson, “Gulf Coast States at Odds on Penalties for Oil Spill,” 17 November 2012, New York Times. 29Maeve Reston, “Louisiana Senator Adopts Risky Strategy,” 27 December 2013, Los Angeles Times; Steven Mufson, “Landrieu Counting her Friends,” 11 October 2014, Washington Post. 30Molly Ball, “The Last Southern Democrat,” 4 December 2014, The Atlantic, http://www.theatlantic.com/politics/archive/2014/12/mary-landrieu-louisiana-senate-runoff-the-last-southern-democrat/383412/ (accessed 1 March 2016). 31Valerie Bauerlein, “Mary Landrieu Battles Shifting Tide,” 4 December 2014, Wall Street Journal. 32“Election Statistics, 1920 to Present,” http://history.house.gov/Institution/Election-Statistics/Election-Statistics/. 33Deborah Barfield Berry, “Life after the Senate: What’s Mary Landrieu Doing?,” 14 August 2015, USA Today. 34Diana Samuels, “Mary Landrieu to Serve on CASA Board, Group that Helps Abused Children,” 20 November 2015, The Times-Picayune (New Orleans). "Mary Landrieu," in Women in Congress, 1917-2006. Prepared under the direction of the Committee on House Administration by the Office of History & Preservation, U.S. House of Representatives. Washington, D.C.: Government Printing Office, 2006.